Almost 2 weeks ago I posted about Manchester United's turning point when they overtook City for the first time after playing catch up for so long. Still 7 games to play, Roberto Mancini has all but waved the white flag in the English Premier League title race after his Manchester City side went down 1-0 to Arsenal at The Emirates. 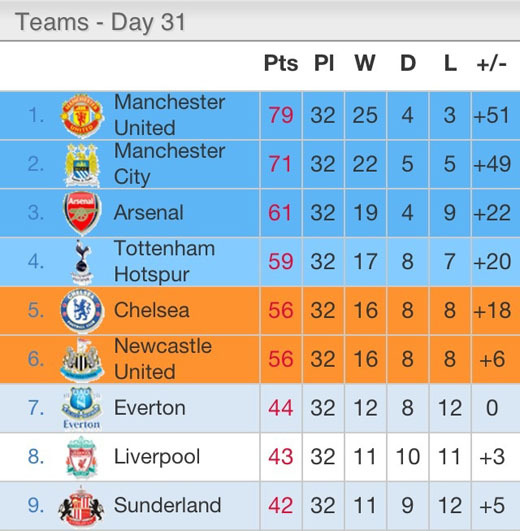 EPL Table after 32 games. There are 6 more games to play and 18 points up for grab..
With Manchester United beating Queens Park Rangers 2-0 at Old Trafford earlier at lunchtime, City fell 8 points behind their rivals and needed to win at Arsenal. But they failed to react and fell to a stunning Mikel Arteta strike three minutes from time. They also had mercurial striker Mario Balotelli sent off shortly afterwards for a second bookable offense. It looks increasingly likely that the title is staying at Old Trafford for a record 20th time. What an achievement that would be. Go United! MU will be the champion at the end. Where is my team, Liverpool? @rainfield61. Hmm, position 8 seem like very unfamiliar those days, no?